Before we get started on the testimony of Christopher Steele, the author of the Trump-Russia dossier that was used to obtain a FISA warrant to spy on members of President’s Trump’s campaign, let’s recall how the dossier came into being. For that, we’ll go to an article from October 2017, published in the radically leftist Washington Post. […][I]t is crystal clear that the Steele dossier, an unverified Clinton-campaign product, was the driving force behind the Trump–Russia investigation. The latest from this week is that the dossier author, Christopher Steele, has admitted that the purpose of the dossier was to allow Hillary Clinton to contest the 2016 election, in case she lost. Recall that this dossier has been the basis of nearly TWO YEARS of groundless speculation about Trump-Russia collusion from the Democrat “journalists” in the mainstream media. TWO YEARS, all because of a Democrat-funded dossier whose purpose was to allow Clinton to challenge the results of the 2016 presidential election. For the record, disgraced FBI directorJames Comey has lied over and over again about how who paid for the Steele dossier. 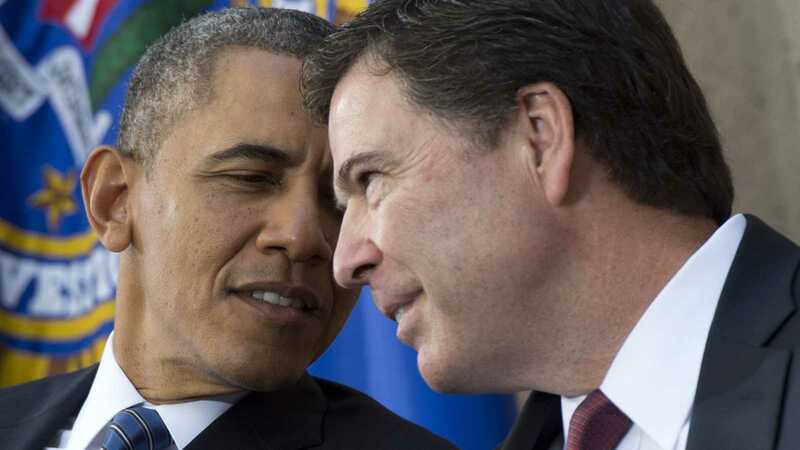 Former FBI Director James Comey falsely claimed throughout two recently congressional interviews that Republicans were the initial backers of the infamous Steele dossier, which alleges a vast conspiracy between the Trump campaign and Russian government to influence the 2016 election. Comey claimed twice in an interview Monday with the House Judiciary and House Oversight Committees that Republicans initially commissioned the work of Christopher Steele, the former British spy behind the dossier. He made similar claims twice more in an interview with the same committees on Dec. 7. “I remember being told that Steele’s work had been funded first by Republicans opposed to Trump, then by Democrats opposed to Trump,” Comey said at one point during Monday’s interview, according to a transcript of the session. James Comey, his Democrat defenders, and their allies in the mainstream media have every reason to distort the truth, but now you have the facts. Nobody knows American politics better than Michael Barone. In this article for Real Clear Politics, he explains what we now know about collusion during the 2016 presidential election. This piece was tweeted by Brit Hume AND Hugh Hewitt (of MSNBC) so you know it’s fair and balanced. The Russia collusion charge had some initial credibility because of businessman Donald Trump’s dealings in Russia and candidate Trump’s off-putting praise of Vladimir Putin. It was fueled by breathless media coverage of such trivial events as Jeff Sessions’ conversation with the Russian ambassador at a Washington reception — and, of course, by the appointment of former FBI Director Robert Mueller as special counsel. But Mueller’s prosecutions of Trump campaign operatives were for misdeeds long before the campaign, and his indictment of 13 Russians specified that no American was a “knowing participant” in their work. Now there’s talk that Mueller is winding up his investigation. It seems unlikely that whatever he reports will fulfill the daydreams so many liberals have of making Trump go the way of Richard Nixon. So much for that story. Just think of how much the mainstream media talked about a story that turned out to be a big nothingburger. Meanwhile, the evidence builds of collusion by Obama administration law enforcement and intelligence personnel in trying to elect Hillary Clinton and defeat and delegitimize Trump in and after the 2016 election. The investigation of Clinton’s illegal email system was conducted with kid gloves. FBI Director James Comey accepted Attorney General Loretta Lynch’s order to call it a “matter” rather than an “investigation.” Clinton aides were allowed to keep her emails and destroy 30,000 of them, plus cellphones. They were not subject to grand jury subpoenas, and a potential co-defendant was allowed to claim attorney-client privilege. On June 27, 2016, Lynch clandestinely met with Bill Clinton on his plane at the Phoenix airport — a meeting that became known only thanks to an alert local TV reporter. Lynch supposedly left the decision on prosecution to Comey, who on July 5 announced publicly that Clinton had been “extremely careless” but lacked intent to violate the law, even though the statute punishes such violations whether they are intentional or not. Contrast that with the collusion of Obama officials with the Clinton campaign-financed Christophe Steele/Fusion GPS dossier alleging Trump ties with Russians. Comey and the Justice Department used it, without divulging who paid for it, to get a FISA warrant to surveil former Trump campaign operative Carter Page’s future and past communications — the “wiretap” Trump was derided for mentioning. Similarly, when Comey informed Trump in January 2017 of the contents of the then-unpublished Steele dossier, he didn’t reveal that the Clinton campaign had paid for it. Asked on his iatrogenic book tour why not, he blandly said he didn’t know. And maybe he doesn’t actually realize he was employing J. Edgar Hoover-like tactics to keep his job. Maybe. In any case, after he was fired, he immediately sent four of his internal memos, at least one of them classified, to a law professor friend to leak them to the press, with the intent of getting a special counsel appointed — who turned out to be his longtime friend and ally Robert Mueller. Collusion, anyone? I wonder if the mainstream media will be as excited about reporting on this one? The mainstream media seems intent on presenting Comey as some kind of superstar public servant. But the truth is very different. Trump needs to appoint people to these law enforcement agencies who will investigate actual crimes that were committed by the previous administration and their allies in the media. I’d like to see people who use government as a weapon put behind bars. We have to know for certain that using the government as a weapon to influence elections has consequences.